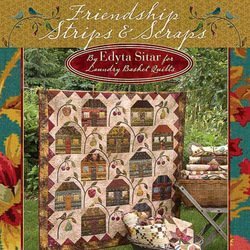 18 beautiful Quilting projects: strips & scraps exchange ideas, easy step-by-step strip panels technique by Edyta Sitar for Laundry Basket Quilts. Edyta has created a simple strip panel technique and designed 18 gorgeous quilt projects. Share from your own stash or use precut fabric strips such as jelly rolls. Ease, versatility, fun and satisfaction guaranteed!